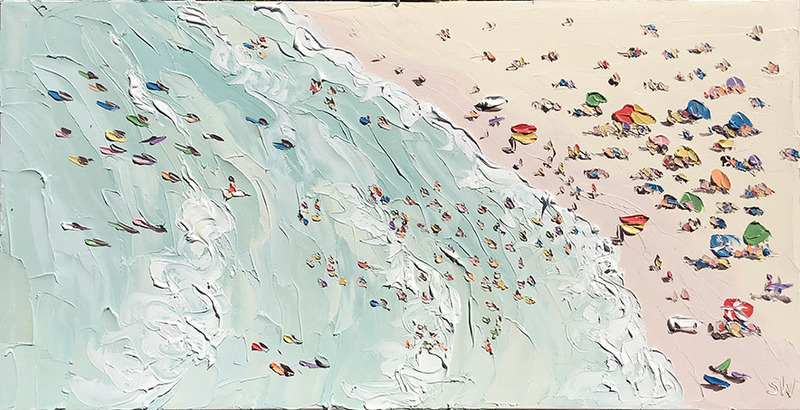 It is hard not to take this comment as self-referential, because Sally West is not unlike the birds she describes: her most famous paintings capture seasides from an all-seeing height, with clumps of paint marking beachgoers and other earthly shadows as they sweep across the foaming waves. 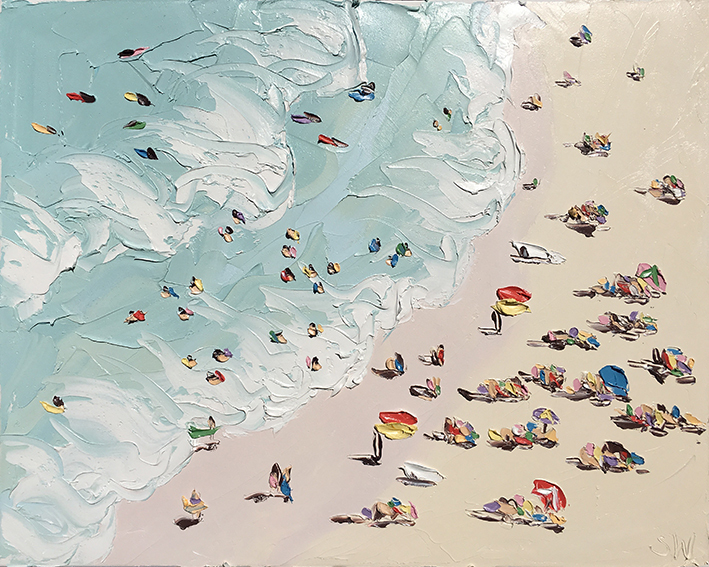 West relies for her aesthetic effects on heavy impasto (this means her works are textured with the application of thick lashes of oil paint) and on her considered use of colour, juxtaposing strong, almost screaming, flakes of pigment to broad shores of muted shade. In these paintings people and objects become patterns, and through repetition these shapes and forms acquire a wondrous touch. 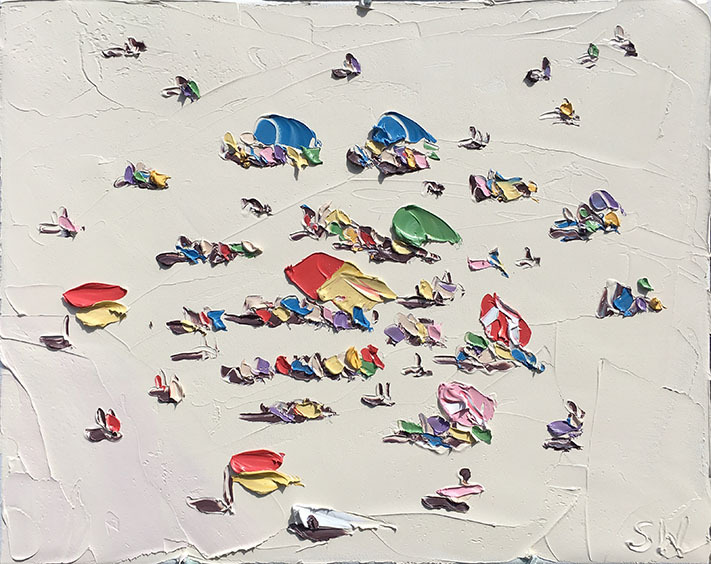 Of course, to the most facetious and prosaic amongst us these paintings may be evocative of rock climbing walls or fields cluttered with nailed and popped balloons. Tush, tush. Not to my readership. In her beach studies, West has found a niche, and in it her direction, which she has followed with devotion. Nonetheless, it has been a long journey, and it started in West Wyalong, Central NSW, where she was raised on a farm. At the age of seven, in the year 1976, the young West won the Australia Post Art Colouring-In Competition. Part of her talent had now been unveiled, and the thrill of its spectre would spark West more and more as years went by. One of these paintings is a self-portrait she made at the age of twelve. The portrait still hangs in the farmhouse of her childhood, in the very bedroom she grew up in. In that same year she would sell her first painting at the Gould Street Gallery in Bondi. These sojourns allowed her to rethink and develop her use of colour further, into something unique. But what about her impasto technique? These palette knifes are the claws to West’s bird of painterly song. West and her knifes are as inseparable as Todd and his razors; they are crucial extensions of her arm. They dictate the topography of her landscapes, which are invariably convulsive, as if in tsunamic upheaval. As such one may well presume disaster is constantly heading to her seemingly carefree beach scenes. 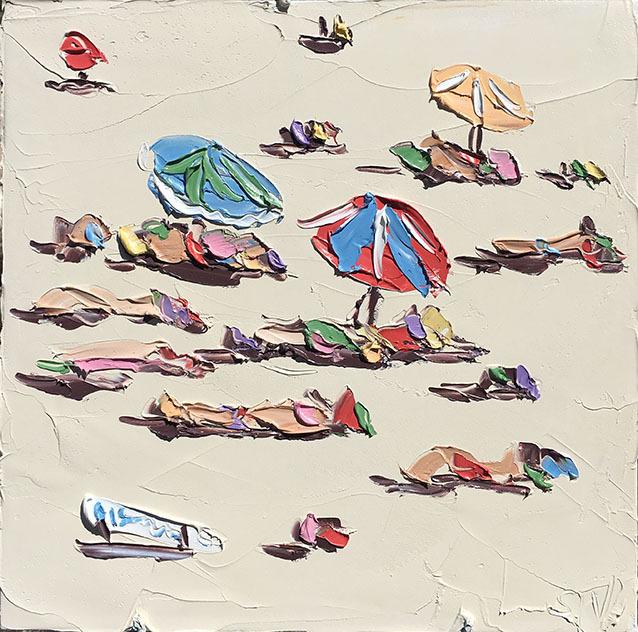 Really, some more should be said about these beach studies, as any of them is instantly recognisable as West’s own work: even though they are literally impressionistic, they are not usually categorised with the works of other plein air impressionists, in part because there is no one who paints them quite the same way she does. Instead, I wonder whether it would be tenuous to link them with the surrealist work of Yves Tanguy. Hollywood-based photographer Gray Malin’s series À La Plage, À La Piscine (‘At The Beach, At The Pool’) comes to mind too. 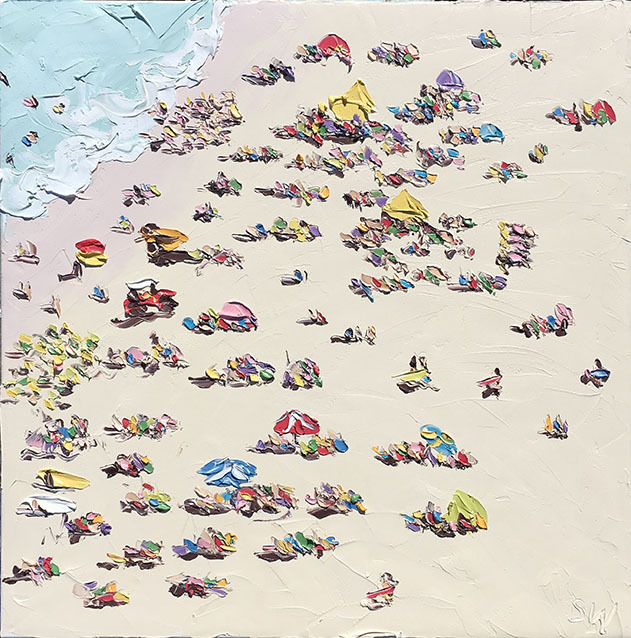 He takes aerial pictures of colourful beaches, allegedly ‘capturing the spirit of summer’. 'A lot of people ask me if I have painted from photos taken with a drone. I haven’t. I paint aerial scenes from headlands, but I know plenty of photographers who use drones to take pictures,' she says, dismissing the idea that she uses photography for her paintings in any fundamental way. She has predominantly engaged herself with the works of painters: Basquiat, Gauguin , Matisse, Picasso, Charles Blackman, John Olsen, Brett Whiteley. Sometimes West packs up her palette paws, waves bye-bye to the waves, the surfers, the swimmers, and descends from her high rock. She then spends her efforts at (rather accomplished) flower studies, and sometimes portraits, such as the likeness she painted of ‘maverick politician’ Bill Heffernan. 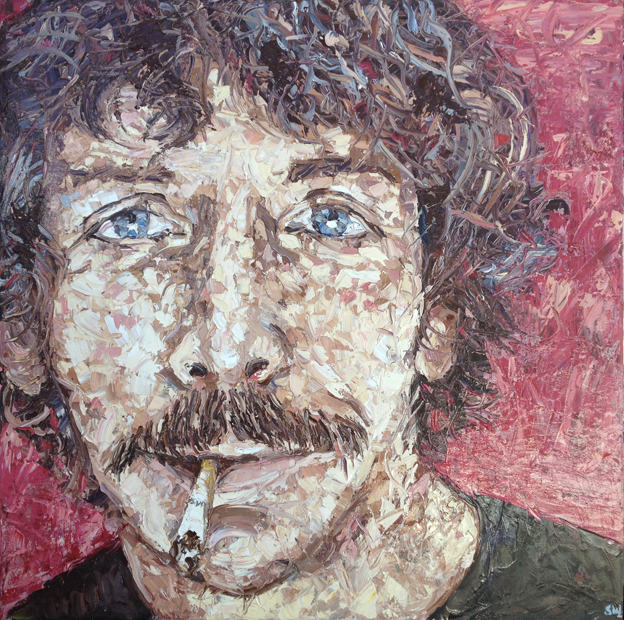 Another notable sitter was actor Ben Mendelsohn. In this portrait Mendelsohn’s hair is a curly bush of thorns, and his face an apparent collection of coloured glass shards, a mismatched mosaic of charm. Despite this, West clearly relishes capturing her sitters on a canvas. Her portraits are still of varied quality and merit, but she has shown me a number of portraits executed in different manners of painting, and they do attest to her appetite for artistic exploration. And this adventurous mindset will, undoubtely, also make her an accomplished player in the field of portraiture. At present West is again packing her car full of supplies. She will soon be off to a new destination. Her husband says her eyes glaze over once she starts painting, as though Sally locks herself up behind the bars of her own blue eyes. Stirring within her are water, sand, sea, and breeze. In times of relative calamity (such as these), people long for complementary calm. And whatever trouble the art critic may conjure up by means of allegory or obscurantist mumbo jumbo, he cannot ultimately distract from the essentially still and reassuring nature of these paintings. Her splendid song of shade and shore will be heard, only because people want to hear her song. It has thus far already been heard in exhibitions in London, Paris, New York and Hong Kong. Her artistic voice is evolving and reaching new heights every working day. The wind blows west; this bird will fly. For more information on Sally West's work visit her website here.